The camera ready paper must have 4 to 6 pages, the last page will be at least 1/2 filled. Please use A4 size paper. For A4-size paper, set the top and bottom margins to 35 mm, left and right margins to 15 mm. The column width is 88 mm (3.45 in). The space between the two columns is 5 mm (0.2 in). On the last page of your paper, try to adjust the lengths of the two columns so that they are the same. Paragraph indentation is about 3.5 mm (0.14 in). Left- and right-justify your columns. Use automatic hyphenation and check spelling. Use tables and figures to adjust column length. Figures and tables must be placed in the top or at the end of columns, but not before they have been referred in the text. 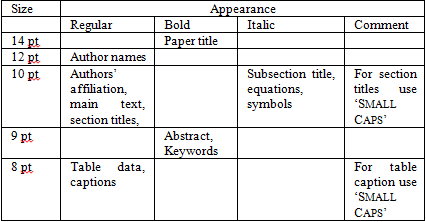 Try to follow the type sizes specified in Table I as best you can. The recommended font type is Times New Roman. We advice you to use the document template available, here. Paper should be sent, in Word format or Reach Text format, using the submission_form. The paper must be accompanied by the Copyright form, hand signed and scanned, in pdf or jpeg format. Uploading files are allowed in two sessions, spring session and autumn session. The papers sent in spring session are evaluated for the issue to apper in October and the papers sent in autumn session are considered for the issue to appear in April. Since April 20, 2011 the paper status may be checked online using the link recevied by author when he activates the account on the submission system. Only the authors of accepted papers are notified by e-mail. The papers sent by e-mail will be not considered! The e-mail address is used only occasionally for the correspondence with the authors of accepted papers. For papers sent after March 1st 2010 and accepted for publication, the publication fee is $35 (US) and covers a small quota of the publication expenses. The journal does not charge applicants for paper submission. Authors who are iterested in receiving a printed sample of the journal must make an express request at . The shipping tax is about 10$.